Remember when licensed kart racers used to be good?… Yeah, me neither. Arnold and Helga from Hey Arnold! 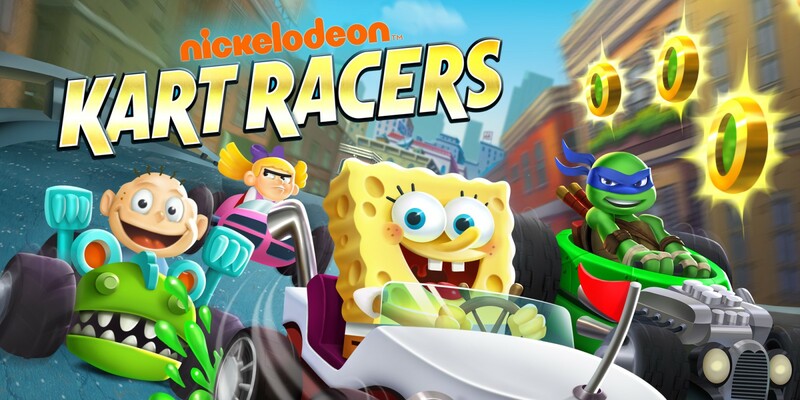 This game released in 2018 somehow manages to represent fewer franchises and feature fewer characters than the original Nicktoons Racing for the PlayStation. The racers all look slightly strange as well, with awkward animations and odd chibi-esque models that attempt to go for a uniform style but just end up looking… off. At least they drive fitting vehicles like Tommy’s modified Reptar Wagon or Arnold’s iconic “The Mauve Avenger” go-kart. Despite the lackluster roster, the item and course selection have some surprising deep cuts. While there are the expected choices like Bikini Bottom and P.S. 118, I never would have expected to race through Glove World from SpongeBob or Dimension X from TMNT. Similarly, the item selection pulls from classic objects from each series’ history. SpongeBob’s Kah-Rah-Tay Glove counters projectiles, the Rugrats’ bottle launches ahead like a missile, and Baxter Stockman’s robotic Mousers steal items from opponents. It shows that developers did their homework on the various IPs involved, though I wish they’d done a little more work on the game instead. Nickelodeon Kart Racing claims to offer 24 tracks to race on, but this is not entirely accurate. In truth there are eight courses (two for each of the four franchises represented), the same eight courses again but reversed, set at night, and given a different name to trick you into thinking they are new, and eight more “slime” courses that again reuse assets from the original eight courses but are flooded with nuclear green Nickelodeon slime. These slime courses are some of the worst in the game, for reasons I’ll expand upon later. As for items, the game cribs an element from Mario Kart: Double Dash by giving each character access to a special item that only they can use – and just like in Double Dash, these items are wildly unbalanced and make some characters straight up better or worse than others. For example, Patrick’s special item is his pet rock, which he can throw repeatedly at nearby opponents (though in practice this tends to be mostly useless unless you’re right in the thick of a crowd). Meanwhile, Arnold summons Pigeon Man’s pigeons to give him a speed boost and automatically carry him around the track with no input required by the player. These are clearly not equal. Powerful items also appear way too frequently in general – at one point I watched in horror as I was blasted with six different items in the span of 20 seconds. I wish I could say the actual racing makes up for all of this, but it doesn’t. It’s just your typical Mario Kart clone but with weird drifting that shifts the camera to an almost over-the-shoulder perspective and completely stops if you so much as touch the edge of some rough terrain while doing it. Sometimes you will come across slime on the track, which you can drive over to fill your boost meter at the expense of losing a bit of traction. There are also glider sections similar to Mario Kart 7 and 8, though they really just boil down to moving your kart slightly up or down in the air as there are no actual glider physics to speak of. In an attempt to freshen up a familiar formula, they’ve also stolen an element from Sonic & All-Stars Racing Transformed by having your kart morph into a jet ski when you hit areas of the track flooded with water-like slime – except these sections do not remotely control like you’re driving a jet-ski aqua moto. Imagine if your kart suddenly had slightly better turning but no way to drift, and you basically have this game’s bizarre idea of water physics. I honestly question why they even added this mechanic when it handles far worse than the regular kart racing. Remember those slime courses I mentioned earlier? Yeah, they’re played entirely with the jet skis, and they’re just as fun as they sound. The game’s Grand Prix mode is divided into six cups of four races each, as well as three unlockable mega-cups where you play eight races in a row. These can be played solo or in Team mode with a friend or CPU, but I do NOT recommend the latter. Let me explain: similar to when playing teams in Mario Kart, there are five teams of two racers each, and your overall ranking corresponds to how well you placed in each race (first place gets 10 points, second place gets 9 points, and so on). So if you placed first, but your teammate placed last, you’ll have fewer overall points than a team where both members placed third and fourth. Simple stuff, right? Yeah, you’d think so. I played a cup in Team mode with my brother, and here is how our team’s points looked at the end of each race. Granted the game’s target audience probably doesn’t know how to count yet, but I’m sure the fine folks reading this review can, so maybe you can help me figure out how I started with 18 points, ended the third race with 40, and finished with 27, causing us to lose to three other CPU teams that we consistently outperformed? This mode is, in a word, broken. It literally does not function. Thankfully there are no unlockables that require you to play this mode, so you can just skip it altogether. Oh, and there’s also a Battle mode that’s exactly like Mario Kart‘s. I figured it was only fitting that I give a throwaway mention to what amounts to a throwaway mode. Speaking of unlockables, don’t expect any secret characters or courses. No, the only things you’ll find here besides the aforementioned extra cups are car parts to purchase in the shop. You can buy tires, engines, spoilers, PWCs, and paint jobs for your kart, each themed after things like the Jolly Olly Man’s ice cream truck or the Flying Dutchman’s ship. They all provide various stat boosts, and while some parts are definitively better than others, it hardly matters when races will ultimately come down to who was bombarded with fewer items. As you may have guessed from the screenshots, the visuals in this game are fairly mediocre. The uniform lighting on everything causes the game to have this cheap, washed outlook, and I have to give special mention to jet ski slime effects which make it look like Fruit Roll-Ups are flying out from underneath your vehicle. Still, even the graphics are better than the disastrous audio. The music in this game is simply unbearable. Everything besides the vaguely passable main menu theme sounds like the composer just went to town on their synthesizer keyboard and didn’t care what the result sounded like before they slapped it in the game. Worst of all is the total lack of any voice samples for any of the characters. They speak in-game, but only through text boxes… because reading inane dialogue is exactly what you want to do during the middle of an intense race, right? Nickelodeon Kart Racers is not a game for everyone. Even most kids will be bored by the lifeless characters and gameplay, kids-at-heart looking for a nostalgia throwback to their favorite franchises will be disappointed by how few of them are on display, and kart racing fans will be repulsed by the lousy mechanics and lack of online play. If you’re in a Nicktoons mood, your $40 is better spent on a Hulu subscription than on buying this game.